It was one of the most thrilling moments of the season. Xherdan Shaqiri stared down the Kop, arms folded, chest puffed out, a satisfied smirk across his face. The Swiss playmaker had reason to be smug, of course. He had just downed Manchester United, scoring two late goals to give Liverpool a thrilling 3-1 victory. At that stage, a week before Christmas, the diminutive attacker was the toast of Anfield. He crushed United, ending Jose Mourinho’s career at the club in the process and put his side top of the table. When asked about ‘Shaq’ following the game Jurgen Klopp’s face lit up with festive cheer. ‘He’s a wonderful player,’ the German said after the 27-year-old’s match-winning introduction from the bench. After that game, Klopp had nothing but a hearty embrace for Shaqiri but it’s difficult to imagine many hugs between the pair in recent weeks. For that was the apogee of Shaqiri’s debut season on Merseyside. Since then, he has been a peripheral figure during Liverpool’s challenge for a first league title in 29 years. He scored in the Boxing Day win over Newcastle but there hasn’t been much to cheer about for the former Stoke City favourite in 2019. In fact, since the turn of the year, he has started only twice in the league and was hooked off on both occasions. His last start came on January 30 in the 1-1 draw with Leicester City. Klopp to sign a striker in the summer? Get odds on Jovic, Werner & Gomez to sign for Liverpool here! That night, on a snow-dusted Anfield, Shaqiri struggled to assert himself, managing only 46 touches while failing to register a shot or attempt a single dribble. Perhaps that night Klopp realised that Shaqiri, as talented a player as he is, can fulfill only a supporting role in the climactic months of the season. There can be no question over his impact this season. With six goals and two assists in the league, Shaqiri has been directly involved in seven more goals than Naby Keita, a player who cost the Reds four times as much. Indeed, after his heroics against United, some proclaimed him as ‘the signing of the season’ given his modest £13million price-tag. However, while Keita seems to have a place in the side, whether it’s in a more advanced role or further back, Shaqiri’s future is more uncertain. TOO MUCH OF A TACTICAL RISK? He thrived when Klopp switched to a 4-2-3-1, operating as one of the three behind Mohamed Salah. However, the German reverting back to his trademark 4-3-3 has marginalised the Swiss star. While the 4-2-3-1 can fit Salah, Roberto Firmino, Sadio Mane and Shaqiri into the line-up, the latter, Klopp feels, does not have the discipline and defensive work-rate to operate as part of the midfield trio in his 4-3-3. With Salah, Mane and Firmino firmly cemented as the attacking trident, Shaqiri is, quite simply, lower than Keita, Fabinho, James Milner, Jordan Henderson and Georginio Wijnaldum in the pecking order. In fact, since his return, even Adam Lallana has been summoned from the bench ahead of Shaqiri, like in the Merseyside derby or against Bayern Munich. Being shunned against the Bavarians, whom he left in 2015, must have stung. If United was the high, to not be on the pitch as the club who deemed him surplus to requirements crashed out of the Champions League was unquestionably the low-point of his Liverpool career. And it’s a career around which there are major question marks. With Klopp favouring the static-but-safe midfield trio of Henderson, Wijnaldum and Milner in European games, Shaqiri must wonder when he will next start a game. WHATS TO COME FOR BIG SHAQ? After the United game, Klopp spoke of how Shaqiri had tailed off following a promising start to the season, that he had become ‘less decisive’ in his offensive play. Those reservations have almost certainly resurfaced. Shaqiri was ineffective in his last two starts and has paid a heavy price, having been an unused substitute in each of the last five games. Football is not much fun for him at the moment. In a way, his plight feels almost cyclical. He was the star attraction at Stoke but at Liverpool, like at Bayern, he has struggled to maintain a starting berth in a side with title ambitions. In two and a half years at Bayern, he managed only 26 Bundesliga starts. The competition for places was stiff at the Allianz Arena but it is telling that, six years on, Shaqiri is yet to develop into a fully-fledged starter at a club of Liverpool’s stature. 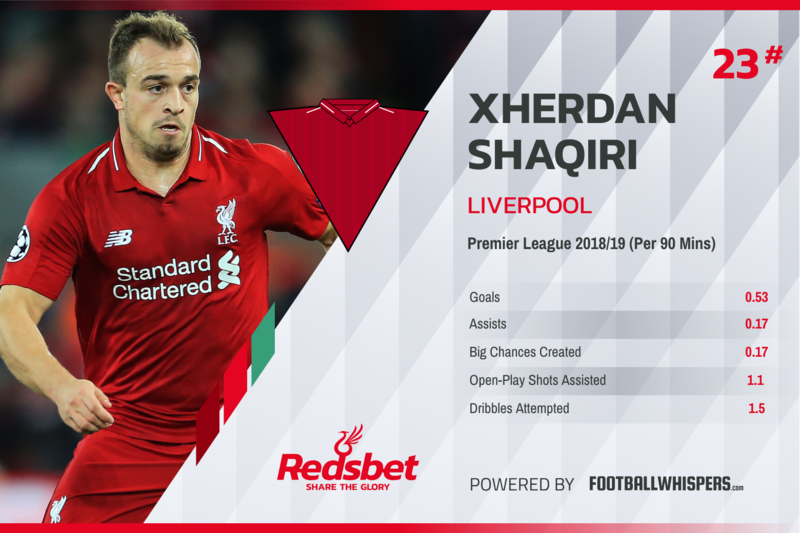 For all his spectacular goals and game-changing ability, Shaqiri is far from the rounded, dependable on-field lieutenant Klopp needs right now. Where that will leave him come the summer remains to be seen.